Four Lebanese soldiers have been killed in fighting with Islamist militants in the Nahr al-Bared Palestinian refugee camp in northern Lebanon. The army responded by shelling the militants, from the Fatah al-Islam group, who have been besieged at the camp for more than a month. It is the second day of clashes since the Lebanese minister of defence declared the Islamist rebels defeated. Defence Minister Elias Murr said on Thursday that leaders of Fatah al-Islam at the camp were on the run. 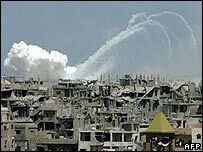 Mr Murr had told Lebanese TV the army had "crushed those terrorists", but that Lebanese troops were continuing their siege amid sporadic shelling and gunfire. Nahr al-Bared, near the northern city of Tripoli, was home to 31,000 people before the fighting broke out. Approximately 2,000 refugees are still believed to be inside the camp.